Implementing proper lawn mowing techniques is one of the most important factors in promoting healthy, weed-free turf. 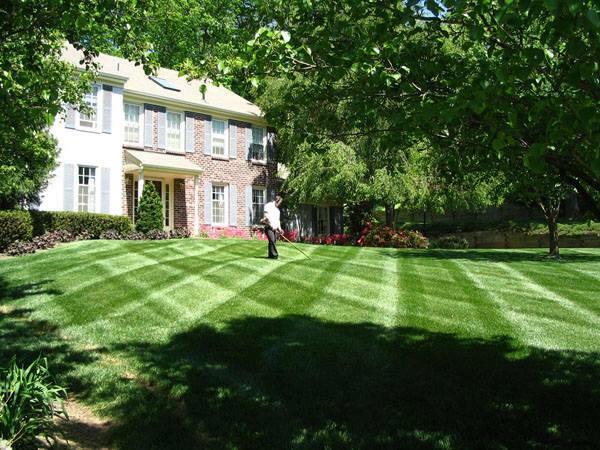 Our team is dedicated to maintaining all of our customers’ lawns to the highest standard. Mower blades are checked and sharpened daily to a razor finish. The undersides of mower decks are scraped at the end of every work day to increase each machine’s ability to create a vacuum effect and lift the blades of grass for a clean and even cut. Mowing height is fully adjustable but rarely are we cutting below three and a half inches to ensure no more than one-third of the grass blade is cut. When rainy weather prevents our team and equipment from accessing customers’ properties, the lawns are often skipped to avoid damage to the soil and turf. During very dry periods or drought, each lawn is inspected for growth. In situations where no growth is present, or at a customer’s request, our technicians will skip mowing to prevent further compacting the dry soil. Our lawn mowing foremen are required to have a minimum of five years of experience in lawn maintenance before we can offer employment. Each crew’s team members are required to have a minimum of three years of experience prior to us considering to add them to our team. Our current foremen each have at least ten years of experience and our crew members have no less than five. Mowing routes are determined by area and service is scheduled for the same day each week. Weather permitting, our mowing crews typically operate like clockwork and cut each lawn at the same time of day every week. Our commitment to providing quality, consistent, and reliable lawn service is taken very seriously.